As device sizes in the semiconductor industries shrink, devices become more vulnerable to smaller contaminant particles, and most conventional cleaning techniques employed in the industry are not effective at smaller scales. 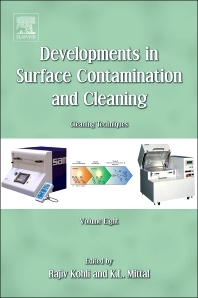 The book series Developments in Surface Contamination and Cleaning as a whole provides an excellent source of information on these alternative cleaning techniques as well as methods for characterization and validation of surface contamination. Each volume has a particular topical focus, covering the key techniques and recent developments in the area. Several novel wet and dry surface cleaning methods are addressed in this Volume. Many of these methods have not been reviewed previously, or the previous reviews are dated. These methods are finding increasing commercial application and the information in this book will be of high value to the reader. Edited by the leading experts in small-scale particle surface contamination, cleaning and cleaning control these books will be an invaluable reference for researchers and engineers in R&D, manufacturing, quality control and procurement specification situated in a multitude of industries such as: aerospace, automotive, biomedical, defense, energy, manufacturing, microelectronics, optics and xerography. Researchers and Engineers in R&D, manufacturing, quality control and procurement specification situated in a multitude of industries such as: aerospace, automotive, biomedical, defense, energy, manufacturing, microelectronics, optics and xerography. 6 Green Assessment—What Makes a Product Green?